Capstan Consulting, LLC (Capstan) is a strategy and management consulting firm whose core competencies include strategic and business planning, project feasibility, and financial analysis in maritime shipping, port infrastructure and terminals, logistics related real estate, and rail transport. The firm leverages its industry based experience to provide strategic and commercial insights, due diligence support, market studies, research, analysis and transaction advisory services to assist clients to make informed, fact based decisions, assess and secure opportunities in the market and address their toughest challenges to improve performance and value. Our clients include both the private and public sectors. 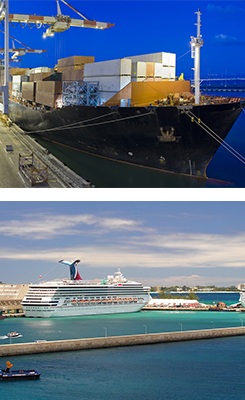 Our private sector clients include shipping lines, port and terminal operators, natural resource companies, financial institutions, investors and railroads. Our public sector clients include government institutions, port authorities and state owned enterprises. Capstan’s professionals have executed projects and client engagements in over 30 countries. The firm is based in Annapolis, Maryland USA (near Washington D.C.) and is managed by its founding Partners, Mr. James Brennan and Mr. Brad Julian. They have more than 40 years and 18 years of industry experience respectively serving in various roles throughout their careers as operators, investors and advisors. The Capstan team also includes experienced analytical and research professionals.